Locals in Ahvaz use makeshift sandbags as flood barriers in absence of state-aid. Severe rain and floods have ravaged more than 27 provinces since May 17. Dozens of videos on social media show frustrated flood stricken locals protesting lack of state aid. In a video from the southwestern province of Khuzestan, a man breaks down in tears and says that he has not been given a tent after he lost his home seven days ago. “How much cruelty?! I have been surrounded by water for seven days. They can’t come here and give me a tent?! My sister is sleeping under a tree. Didn’t we participate in the (Iran-Iraq) war to defend our country,” the man cries. “Who should I ask (for help)? Whomever I ask, they say it’s not my responsibility. I asked the IRGC, the army and the Governor. Who should I ask then?! You give me an address to go wherever you say. Maybe I should kill myself. Why am I even alive? !” the distraught man cries out. These kinds of scenes coming from Iran are only the tip of the iceberg in terms of growing anger and frustration with the government. Flood victims have taken matters in their own hands in the absence of state aid. Videos show locals building flood barriers by filling up rice bags and other makeshift sandbags. Images show young men in Khuzestan sleeping on floods barriers to guard their barriers during the night. Young men sleeping on flood barriers to guards barriers in SW province of Khuzestan. In another video, Iranian Arab women are seen making bread for flood victims while young people in Lorestan go trekking for hours via mountains to get aid to villages in the western province that have lost access to roads. Many believe that the lack of state aid will lead to major unrest after the floods. According to Abbas Abdi, a so-called “reformist” journalist, Iranians were just waiting for an opportunity to vent out their anger. He told Fararu website on April 9 that that popular protests and the people’s disenchantment with the state had nothing to do with the “enemy” and had everything to do with the unfulfilled demands of Iranians. “The people are waiting for an opportunity to vent out (their frustration) and what better opportunity than floods and similar incidents,” Abdi added. Before this, a regime affiliated political strategist and former intelligence official, Saied Hajarian, also warned that lack of flood aid could get out of hand. The regime has been discredited many years ago. This became even more evident after protests erupted across almost all Iranian province in 2017/2018. Another regime affiliated website, Shoaar Sal, cited the regime’s negligence in dealing with the floods in Lorestan and warned that the “people’s increased distrust will have horrifying effects in the future”. Ebtekar daily, close to Iran’s President Rouhani, noted that Iranians had lost faith in state-run media and had turned to social media platforms for news on the floods. “We continue to witness the public’s lack of trust in official media against social networks. The internet and reports on social media are more trusted by the people than official media,” the newspaper wrote. Before this, Iran’s Attorney General said that publishing “fake” news on the floods was a security violation adding that those who published such news would be dealt with as “disrupting the security of the country”. Tehran’s Chief of Police also announced that four people had been arrested in the capital for “spreading rumors” about the incompetence of officials in flood relief efforts. The regime has concealed the extent of the damages and fatalities in the floods. According to Iranian officials, 70 people were killed during the more than 20 days of floods. 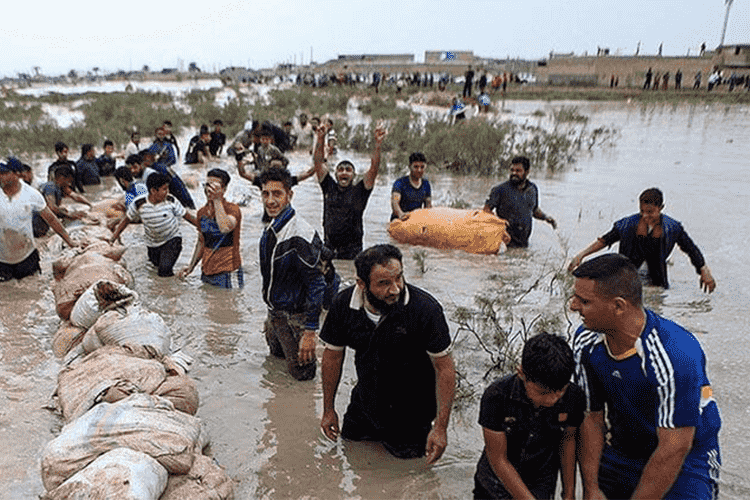 However, locals say that a few hundred were killed in ravaging floods especially in the historical city of Shiraz and the western town of Poldokhtar.